Ever since I read The Little House on the Prairie as a child, I have enjoyed stories of men and women who have braved the Western untouched territories of North America. 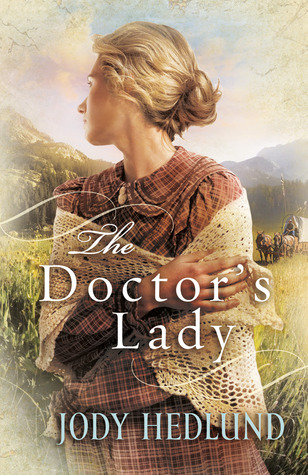 The Doctor's Lady is about such pioneers whose mission was to bring the Christian faith to the American Indians. Priscilla White wanted to be a missionary in India but the Missionary Board stated she needed to be married. This upset Priscilla who had no intention of marrying until she met Dr. Eli Ernest, a missionary who'd returned from the wilds of the Oregon Country to raise funds for the clinic he was to build to help the Nez Perce Indians. Again, the board stated he was to be married , so he and Priscilla marry in name only so that they both can fulfil their dreams. As they make the rough and perilous journey of seven months from New York to Waiilatpu, Priscilla and Eli discover more than just respect for one another. I loved this story. It was very well-written, well-paced and kept my interest throughout. And I was simply amazed at what Priscilla and Eli had to go through on their journey. The author says that this story was inspired by the true story of Marcus and Narcissa Whitman, a young missionary couple who travelled overland to Oregon in 1836 for the purpose of starting a mission among the Nez Perce Indians. The author did a lot of research and it showed. The characters were real to me, well developed and likable, and flawed. The story was realistic and at times suspenseful as they dealt with life and death situations. I was touched by how far this missionary couple was willing to go to help others, and how their view of the American Indians changed as they entered into their territory. This was great historical fiction. I have another book by Jody Hedlund that I now really look forward to reading. This author has been added to my list of favourite authors.